If you have a cat that likes to dig too much or urinates over the litter box, the LitterMaid High Sided Litter Pan helps to contain part of that mess with its high walls of 11 inches tall on sides and back. 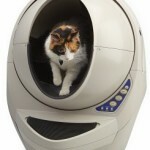 This litter box is made of antimicrobial plastic that reduces the bacteria grown into the plastic preventing odors. The inside of the litter box is easy to clean, with no odd shaped corners and a lower front entry making the scooping a lot easier. LitterMaid High sided litter pan is made from a treated plastic to avoid bacteria buildup. 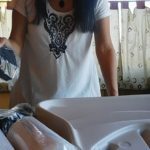 This means the plastic has been injected with an anti-microbial substance prior to being molded which gives it this antibacterial characteristic. 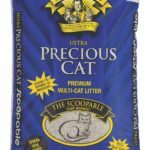 The construction makes this litter box easy to clean since its walls are smooth and the bottom is a little more textured to make it stronger against scratching. 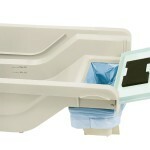 The inside of the litter box is free of ridges or grooves to make it more scoop friendly. The stickers outside of the litter box are really hard to remove. √ A good product to remove the stickers is the WD-40 Spray that works well with any type of glue. √ Another tip to remove the stickers is having a lot of patience and carefully pick off a tiny corner and slowly pull, making sure to see the adhesive on the sticker at all times while pulling. This takes about 20 minutes to completely remove without leaving glue residues. √ To deal with possible litter going out through the entry, get a mat and place it right outside the entryway. All that litter will go there, you just grab the mat and dump the residue litter right back in the box. 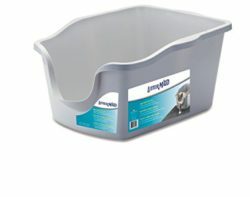 LitterMaid High Sided Litter Pan is a good solution for high cat peers that don’t like covered litter boxes. The lower entry is a good advantage for elderly cats, kittens or disabled pets, but this could be a “con” if the cat decides to urinate against the entry or to cover against that direction as well. Also, if you have a tall cat this may not be your solution since the walls are 11 inches and may not be tall enough for your tall cat.